Somerset and Devon Archives collect documents in all sorts of formats: from vellum and parchment to books and, of course, paper. 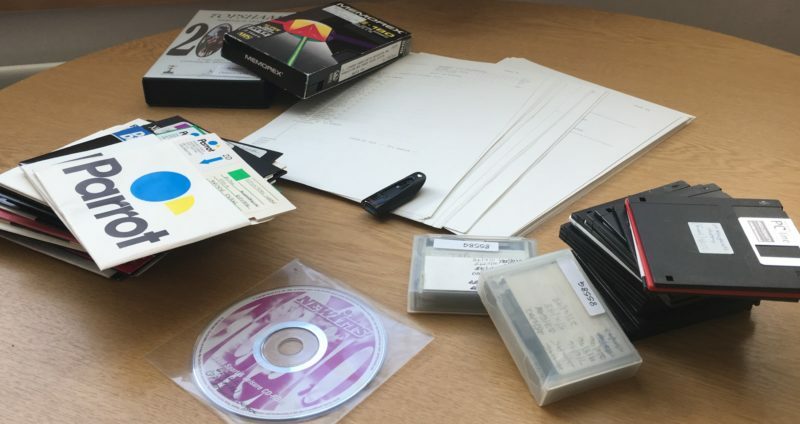 Increasingly, though, records come to us on digital media, like floppy disks and memory sticks. Digital preservation presents us with a whole new set of challenges. Although there can be a physical item, such as a memory stick, the important information is a set of data, which is vulnerable in all sorts of ways. Digital media becomes obsolete in a way that doesn’t affect paper records; documents held on a floppy disk are at risk of being lost, because very few modern computers now have floppy disk drives. Similarly, alterations made to a physical document can be seen because they will leave a mark; digital records can be altered without leaving a visible trace. Our Digital Preservation project aims to overcome these issues, by providing a storage solution which preserves digital records. The system will accept files in almost any format and convert them to a ‘stable’ format which can continue to be accessed in the future. It will run checks on files to ensure they haven’t been tampered with, and that they are still the same as what was originally ingested. It also allows us to generate user-friendly copies, without accessing or risking damage to the original, so that users in the searchroom can access our digital records, just as they can our paper collections. Digital Preservation is fast becoming a new cornerstone of archive preservation, ensuring the security of a new class of documents for generations to come.